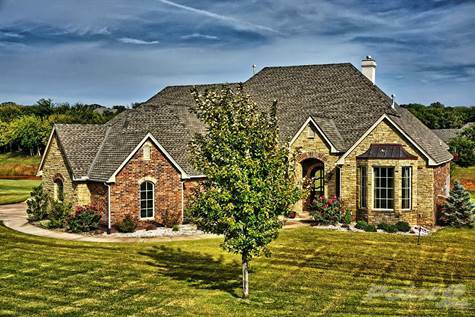 Stone Valley Ranch I, Edmond - 5 bedrooms, 3 full baths & 2 half baths, study, Theater/game room upstairs, 2 dining, 3 car garage, 4,205 sq. ft. (est. ), built in 2008 on 1 acre lot with a view of the pond from backyard. Stone Valley Ranch addition. *ALSO FOR RENT: $3,500.00 PER MONTH. Many custom features, granite thru-out, crown molding, wired for surround sound upstairs & down, giant windows all around the house, hardwood flooring in formal dining & entry, carpet in living areas & bedrooms, tile in kitchen & baths. Living has gas fireplace & built-ins. Study has built-in desk & bookshelves. Huge open kitchen with JennAire appliances, double ovens w/convection, gas cooktop w/grill & pot filling spout, 2 dishwashers (1 is double drawer dishwasher & 1 is full-sized), island w/vegetable sink, breakfast bar, walk-in pantry. Walk-in closets in 3 bedrooms, including huge one in master. 3 tubs (all have whirlpool jets). Large master w/huge walk-in closet w/built-in dresser, separate his & hers sinks, walk-in shower, huge whirlpool garden tub. Large laundry room w/sink & built-in storage. Tons of storage thru-out house. Large upstairs carpeted & covered patio, downstairs covered patio, both with great views of the pond, gas hook-up for grill, Rainbird sprinkler system (runs off the well), Storm Shelter. Tankless hot water heater, well, aerobic Septic system, 3 a/c units (2 down & 1 upstairs), gas heaters, Cox & ATT hookups, OG&E SmartHours installed, security system, smoke alarm. Edmond Schools (Centennial, Sequoyah, Edmond North). School bus pick up in front of house. Exterior: Large upstairs carpeted & covered patio, downstairs covered patio, both with great views of the pond, gas hook-up for grill, Rainbird sprinkler system (runs off the well), Storm Shelter, Well, Aerobic Septic system. Mechanical: Garage door lift, Cox & ATT hookups, security system, smoke alarm. Directions: I-35 N. to Waterloo, go E. to Midwest Blvd, go S to Stone Valley Ranch entrance.